Make fast and delicious snacks or get dinner going quickly with Bosch's Quick-therm technology. Each cooking zone reaches your desired heat in a flash, so they're ready to go as soon as you've prepared your ingredients. Heat beans up for a tasty treat on toast, or sear a steak to perfection; for delicious meals when you want them. All four cooking zones feature nine power settings, so you can tailor the heat to suit what you're cooking. Turn one zone down to its lowest setting to keep your potatoes warm, while you crank up another to finish off the gravy. The easy to use dials are mounted on the right of the hob, too, so they aren't accidentally knocked when you lean over to tend to your cooking. 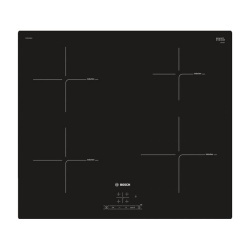 Once you've finished using your Bosch Serie 2 PKE611CA1E Electric Ceramic Hob, residual heat indicators will remind you that the surface is still hot. This smart safety feature helps to prevent accidental burns, and gives you peace of mind that when the indicators go out the surface is safe to touch again. 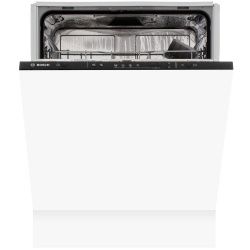 The ultra-modern frameless glass finish of this hob makes cleaning quick and simple. The flat surface means that you can simply wipe over it with a damp cloth to remove marks and spills, keeping your kitchen looking clean and tidy - even after mealtimes. 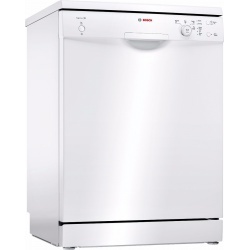 The ActiveWater dishwasher with height-adjustable top basket: Gives you extra space for large and bulky items! The bottom freezer with A++ rating and VitaFresh Box: very efficient- keeps your fruits and vegetables fresh longer. LowFrost: less need to defrost. LowFrost saves you lots of work by considerably reducing ice formation. Fridge-freezers need defrosting much less often and energy consumption remains constant. And when you do need to defrost, we have the right solution for you: a practical vent at the base of the appliance means that this is quick and easy too. The Bosch HBA13B150B Classixx built-in single 3D hot air oven is the perfect cooking partner for your kitchen, with a range of expert cooking functions. 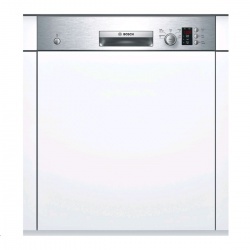 A large 65L capacity, means you will have enough room for lots of cooking, while a straight bar handle, central LED display panel and round controls give it a streamlined, compact look. 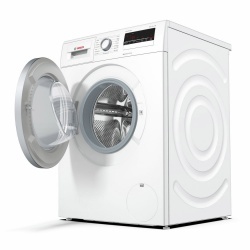 This model boasts an impressive A rating for energy, so you can be sure your'e doing your bit for the environment, while also saving money on future running costs. A hot air-eco setting uses a whopping 30% less energy so you can save even more. For improved heat distribution and a constant circulation of hot air, the 3D hot air function eliminates hot spots, allowing you to cook on three levels simultaneously with more even results. This clever function moves warm air around the cavity to defrost food gently and hygienically, saving you time on having to manually defrost or using a microwave. This model comes with a full width enamelled pan, wire pan insert and 2 wire shelves. Tired of manually defrosting your fridge freezer? 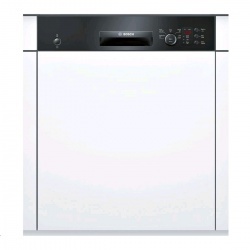 You’ll love the frost free Bosch KGN33NW20G. It’s even been rated with an A+ for energy efficiency, which will help save money on your energy bills and have a lower impact on the environment too. Take a closer look at all the great features on offer. 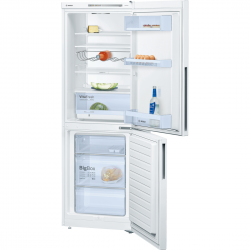 This freestanding fridge freezer offers plenty of storage space for both your chilled and frozen foods. With 192 litres of usable space in the fridge and 87 litres in the freezer, there’s plenty of room for all those supermarket deals. The upper section has three easy pull-out shelves that you can rearrange to organise the fridge to your liking. There’s also a full-width MultiBox that keeps your fruit and vegetables fresher for longer. The freezer contains three spacious drawers, including an easy access drawer, for holding anything from ready meals to roast beef for your Sunday dinner. The easy access drawer comes without a front to it – ideal for keeping items you use regularly – and the two bottom drawers are see-through to help you find what you’re looking for quickly. This means the freezer door isn’t open for too long, which helps to keep your food at the right temperature. When ice builds up in your fridge or freezer, defrosting by hand can be a lengthy process, with the risk of food going to waste. Luckily, with the KGN33NW20G, manual defrosting is a thing of the past. The no frost fridge freezer melts any excess ice, to ensure that your food is kept at the right temperature for 24 hours a day. This Bosch model also comes with the SuperFreeze function to protect food that’s already in the freezer – perfect for when you’re unloading the weekly shop. When this function is selected, the freezer will reduce the temperature, to balance the effect of warm air coming inside the appliance. This will also help to freeze fresh food faster, and once the correct temperature has been reached, the SuperFreeze function turns off automatically. It’s the little extras that make the Bosch KGN33NW20G such a great kitchen appliance. There’s a bright LED light in the fridge to help you find those hidden items, while the multi air flow system gives better circulation, ensuring evenly cool temperatures throughout. The freezer has also been given an excellent 4* rating, meaning it will keep your food frozen for up to 12 months, and is easy to use with its LED electronic control system.